Go Ape features adventures for all! Whether an adventure junkie or nature lover, our Go Ape Springfield, VA location offers two options so adventure seekers of all ages and fitness levels can enjoy a unique outdoor recreation experience. Take 12% off Go Ape Adventures through August 31st when you use promo code: VISITVA19! *Includes Treetop Adventure and Treetop Journey. 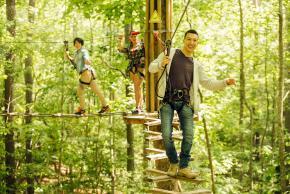 Promo must be applied at the time of the booking Cannot be combined and can only be redeemed at Go Ape in Springfield, VA. Must visit location by August 31st – Excludes July, 4th.